Gwendolyn Ferreti Manjarrez of Somos Tuscaloosa discusses the role of art making in the Alabama immigrant justice movement's victory over HB 56. When passed by the Alabama Legislature in 2011, HB 56 was considered the most egregious and far reaching of the state anti-immigration laws in the country — more harsh than even Arizona’s much derided SB 1070. Recently most of the worst pieces of HB 56 were finally undone. While much of the media coverage has focused on the work of large legal aid groups, I saw firsthand the power and impact that community and arts organizing played in turning the tide in Alabama and making these victories possible. At a Ruckus Society camp at the Highlander Center in 2012, I met many members of the Alabama Coalition for Immigrant Justice, or ACIJ, who were organizing community members to creatively rise up, create art, march, lobby and deploy nonviolent direct action tactics. Gwendolyn Ferreti Manjarrez is a leader within Somos Tuscaloosa, one of the many local groups that are a part of ACIJ. I had the pleasure of working with Gwen at the Highlander camp and again in Birmingham at an arts camp for people mobilizing for immigrant justice in Georgia and Alabama. Here’s an excerpt of our recent conversation, focusing on her analysis of the recent organizing victories in Alabama. The recent victories in overturning much of HB 56 are largely credited to legal organizations like the Southern Poverty Law Center, or SPLC. What role did community organizing play? The community and the community organizing had a big role. One of the main arguments in court was that there is not proof of racial profiling, so community members organized people to call SPLC’s hotline with their stories and build a case against the state. It was really a lot of the community pushing to get SPLC to get cases to then present to a court. What happened right now was a victory through the judicial process. But the SPLC has always looked to the community, and the community has always seeded cases to them. 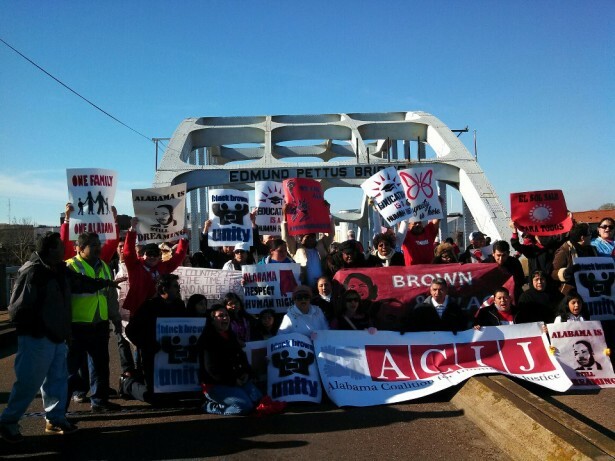 I heard that there was very little organizing around immigrant rights in Alabama before HB 56. How did you begin? Initially, the organizing landscape was very top down — the social justice organizations were essentially law groups like the Alabama Appleseed Center and SPLC. They were lobbying organizations, working to defeat the law using legal mechanisms. Attorneys would get in touch with me and others who were bilingual and bicultural to get an on-the-ground perspective and ask for grassroots support. They asked, “How can we get people to show up to Montgomery to do lobby days?” I said, “People are too scared to drive right now. If we could get buses that would help.” So people started organizing buses to get to the state house. What role did art making have in organizing people to get on the bus? Art making became really central to how I approached community building. In Tuscaloosa, we started banner making as a form of identification and education. People who worked at thrift stores would bring sheets. I’d bring cardboard from dumpsters. Kids would paint while the parents would do the letters. We used a lot of handprints — butterfly and flower handprints — so that the whole families could get involved. We would make them at my house or at the Catholic church. Then we’d drive around with signs on our cars to announce that there would be a rally in Montgomery. The bus would come, and we’d all pile in. What happened once the law passed? What organizing strategies did you use then? Tuscaloosa got hit by a tornado in April, and I lost my house. A lot of people lost their homes, and then a few months later in June HB 56 passed. It brought a lot of fear. The day the law passed, I received dozens and dozens of phone calls. People asked me, “What should I do? Should I leave the state?” It was really traumatic. Our primary message at the time was: “We suffered two disasters and the man made one was worse.” The year 2011 was really, really hard; it was all crisis driven. It went from being small pockets of Latino communities to being shoved into the limelight with HB 56. One of the things that was really hard for dealing with HB 56 was that we didn’t have ways of disseminating accurate information. Radio stations were spreading rumors. We don’t have a Spanish language television station in Alabama. People thought that there would be mass deportations. I know people that just left everything they owned and moved out of state over night. With such limited information dissemination options, what did you do? Our main strategy at first was education and empowering undocumented immigrants to educate other undocumented immigrants through their pre-established social networks. We’d do trainings with the different groups about the law and their rights, and people would then replicate that training in their church or at parties. In our trainings we would do things like popular theater, participatory theater, role plays and interactive games to illustrate how a bill becomes a law. We’d draw things out and share visuals so that regardless of language or education levels people could really understand things enough to share them with their communities. And it worked. The people who used to come to me for information are now sources of information for others. What tactics were used to put pressure on lawmakers? ACIJ had hired organizers to work across the state and support more small towns and cities to organize their own groups. Ours was “Somos Tuscaloosa.” They organized more and more statewide events and marches. We would show up in a consistent color or with a particular prop. Art became an identifier for the Tuscaloosa group, and people were really proud of the art that they made. Can you give some examples of these tactics in action? In Birmingham there was a field hearing of the U.S. Civil Rights Commission, where they were supposed to be hearing testimonies in favor of and in defense of HB 56. But no undocumented community members were invited to speak. So we did a skit around HB 56 using the puppet heads we made at camp as props outside of the hearing. Inside the hearing, community members stood up slowly revealing a message on their backs and then the Undocubus came with another skit — complete with live monarch butterflies. Eventually two undocumented community members were allowed to speak. Later in Tuscaloosa, on the first day of school for the University of Alabama, we made a huge banner with a tornado containing the words “HB 56,” “S-COMM” and “Hate” coming down on a landscape that says “Somos Tuskaloosa.” We then used it in a non-permitted march from a press conference in front of the federal courthouse to Foster Auditorium, where in 1963 Governor Wallace said, “ Segregation now. Segregation tomorrow. Segregation forever.” As we marched through the crowd of Alabama football fans, we chanted “immigrant rights, roll tide” with the same cadence as their football cheer. I’ve heard a lot of criticism of the way people are equating the struggle for civil rights with the struggle for immigrant rights – for example, calling HB 56 “Juan Crow.” What are your thoughts about this? They are very different movements, though there are some overlaps. They are both definitely social justice movements asking for similar things — for equality and equity in treatments — but there are limitations to thinking of them as the same thing. When thinking about what blackness meant in the South and what brownness is in the South — equalizing them doesn’t do either of them justice. Black pastors and the Southern Christian Leadership Conference local chapter have really supported Somos Tuscaloosa. Black pastors have been very much in tune with the idea that this is the same struggle and that we need to work together. The NAACP is a member of ACIJ as well. In Alabama, faith was and is really a practical and theological motivator to become involved in organizing against injustice. Now that the law has been gutted, what’s on the horizon? The fight is not over. The emphasis has changed. What people are asking for and how they ask has changed. There was definitely a change of attitude by all people involved. People’s informal conversations before the HB 56 fight were like “Just leave us alone.” Now people feel emboldened to say, “We want these things” or “We won’t accept this.” There’s even a change with how people interact with local agencies. For example, parents will fight back now if a teacher says something mean to their child. There are now parent groups to empower Latino parents. The fight has become very local and also federal. With time, there’s been an addition of different issues. The years 2011 and 2012 were all about HB 56. In 2013, we started taking on comprehensive immigration reform. Even though we see what is now proposed falls way short of what we need, comprehensive reforms in the Department of Homeland Security may be the only thing we can count on to protect us from the remaining provisions of HB 56 in Alabama and the continued deportations.